The global cold brew coffee market is on a roll. Sales of cold brew coffee were $321 million in 2017 and are expected to reach $1.369 billion by the end of 2023, according to Reports. Web.com, posting a 27.35 percent combined annual growth rate. Where hot brew coffee forces flavor from the bean, cold brew coffee steeps for several hours at low temperatures to bring out a unique flavor. The coffee is then filtered to remove the bitterness, leaving a smooth, cold brew. 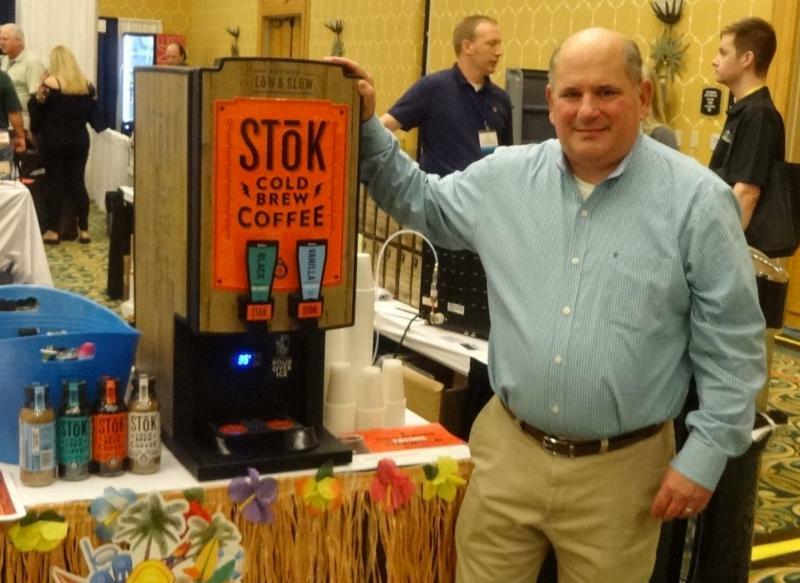 Danone North America introduced its Stok cold brew coffee to micro markets and convenience stores two years ago and has found significant customer acceptance, noted Steve Hoggard, customer business manager for Danone’s away from home division. One reason for the success is that Stok is slightly less bitter than other cold brew coffee, making it especially popular among millennial consumers. Stok is available in both shelf-stable, 13.7-ounce single-serve glass bottles and in 1.5-gallon pre-mix bags for bag-in-the-box coffee dispensers. The 13.7-ounce bottles can be sold in vending machines and micro markets at a suggested retail price of $3 and up, Hoggard said. The bag-in-the-box option can be offered in micro markets or in manual feeding operations. In these settings, the product is served in cups with ice. “A lot of them (micro market operators) are doing ice anyway because they have soda,” Hoggard said. The operator serves the beverage in cups with bar codes that the customer uses to pay at the payment kiosk. Danone North America provides the coffee dispenser that operators can use without charge if they purchase a minimum 13 cases per month, Hoggard said. Danone also services the machines. The premix offering comes in two flavors – black unsweetened and vanilla cream. “It’s cashing in on the cold brew craze, and the bulk (bag-in-the-box) is a lot more economical,” Hoggard said. Hoggard said Stok is the top selling cold brew beverage brand in convenience stores in markets where it is distributed. Several vending and foodservice operations are finding success with the products, Hoggard said. “Everyone really likes the product,” agreed Jim Patterson, president of Patterson Co. Inc., another Premier Brokers Partners’ member. Patterson pointed out that the glass bottles are actually more recyclable than plastic bottles, which should appeal to millennials. Patterson also pointed out that cold brew coffee is a different market than iced coffee. “In reality, they’re two different customers and two different products,” he said. Danone acquired Stok through its acquisition of WhiteWave Foods, Hoggard noted. Product is available through vending warehouse distributors.